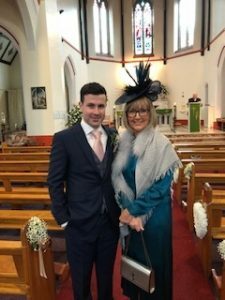 Thanks to Sarah from our Great Harwood Showroom for sharing this photo of her customer Jane at her son’s wedding on Friday. This stunning bespoke Percher was hired from Sarah to complete Jane’s outfit perfectly. If you would like to hire or buy any of our headwear or simply have a look at what is available just give Sarah a call for an appointment on 01254 889574.